When Maureen de Garmeaux copies another character’s skill, does she copy the printed skill, or the actual skill? Since this is the standard of most card games, I assume it is only the printed skill which is cloned (and has thus resigned my self to the loss of an epic game ), but I would certainly not be surprised if it is the other way around. CoC has surprised me before with dynamic implementations of classic mechanics. She copies/gains the skill (whatever the value is at the moment she copies it). Not just the printed. If the character (she copied the skill from) is manipulated afterwards, it is not relevant for her. She remains the skill value she already got. Delightful! Not only because it means I won that Ben Hur of a game, but because I prefer the mechanic this way. Anytime it doesn't specifically say "printed" it means the current value. Printed value is base value for actual value, but any effect that doesn't explicitly mention printed uses current value including all modifiers, etc. Numerical modifiers normally sum up in any order, then are set to result (minimum 0). There are also cards that set skill like Palpable Unhappiness, it will set skill to 0, negating base printed value and any modifiers, but it works only for stuff that was already there when card was played, any new modifiers can change skill after Unhapiness resolves (AFAIK). Is it adressed in the FAQ or something? 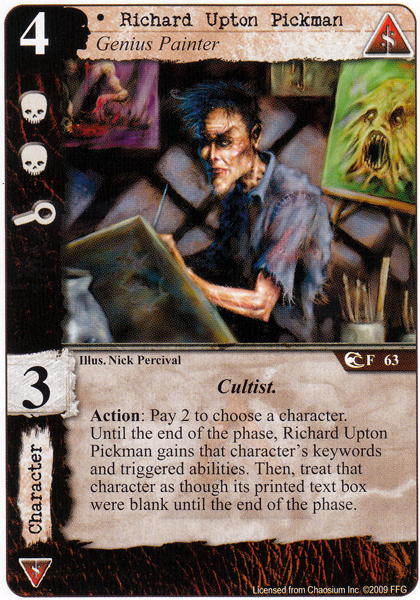 As its quite huge errata concerning all cards that refer to printed skill. As far as I know Like a Moth is the only card that attempts to modify printed skill so I'm not sure anything else would be affected. So Like a Moth is just a Called to the Sea for only one character, but with same cost?! Interresting! One of the few drawbacks of the LCG model is that cards with old wording don't get flushed out and replaced like they do with CCGs. So there are a few odd cards from the very early days whose wording doesn't match that well with how things would work today. Yup, 'Like a Moth' is the only card modifying printed skill. And, yes, it's not really worth including if it was reworded as suggested. What happens when Maureen copies a self referencing card? Not much, unfortunately. The original card name will be copied, usually resulting in the ability being unusable by her. So it becomes non-self-referencing ability? So if I had Maureen and peaslee in play, I could use either card to trigger peaslee, I could use Maureen to get multiple uses out of peaslee. You mean the Yog Peaslee? Well, it's Unique, so once control of him has passed to your opponent, how can you trigger it again? I don't think it's possible to grant your opponent control of a character they already control. Threat Reduction For All Players?